Medium rounded shrub or small tree with a thick stout trunk, grey-green leaves and yellow-gold flowers. Spectacular in flower. Excellent ornamental shrub for gardens. Good long lasting cut flower. Prefers well-drained soils in open sunny position. Grows in granite and sandstone soils in native habitat. 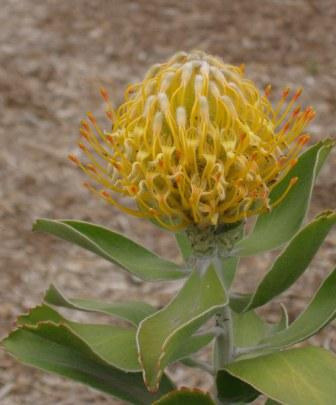 Leucospermum 'Big Mac' is a hybrid Leucospermum conocarpodendron x ?. It was found growing at Terando Rosa Wholesale Nursery in Camarillo. California. It has a true orange flower.